I’d like to take a moment this labor day to remember the Northland Poster Collective. This small, Minneapolis-based collective of artists, founded in 1979, put out 30 years of creative, useful art for progressive and radical movements, including the labor movement. They came up with one of my favorite slogans for labor: The Labor Movement: The Folks Who Brought You the Weekend. The organization unfortunately closed in 2009, amidst the financial meltdown. But their posters and slogans continue to show up on walls, cars, and lapels across the country. 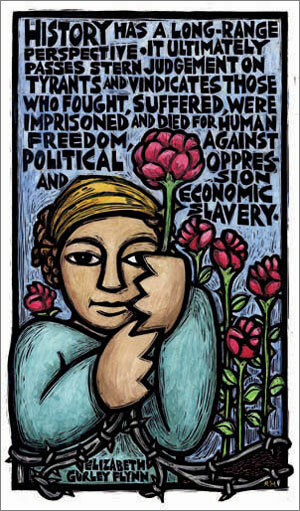 One of the artists, Ricardo Levins Morales, continues this work through his studio, RLM Arts.